Sothink Tree Menu has the features of wide compatibility, high performance, and easy operation. For compatibility, the generated tree menu can be compatible with the most browsers, such as IE 7, Opera 9 and Firefox 2, and Windows Vista included. For performance, Sothink Tree Menu can integrate with Dreamweaver, Expression Web, FrontPage and Golive, which you can build DHTML tree menu in web editor. 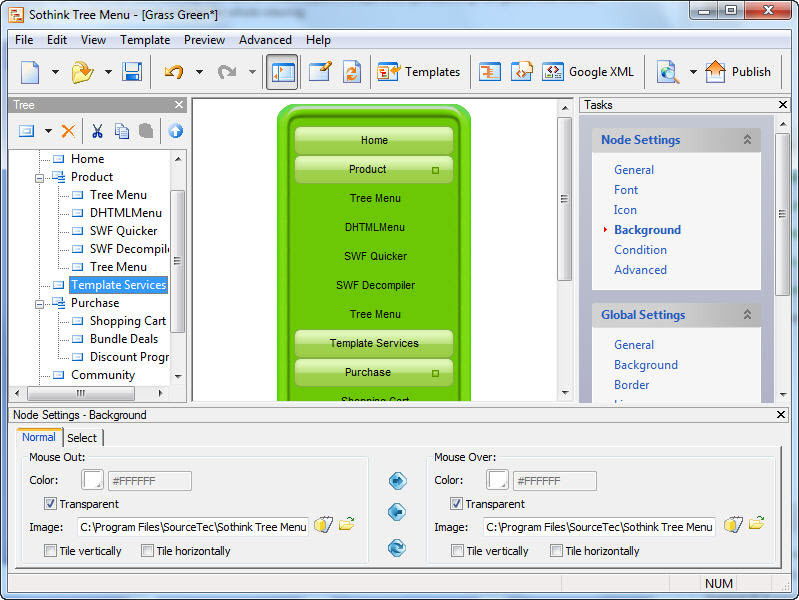 Sothink Tree Menu can make dynamic database-driven tree menus by ASP, PHP, JSP, ASP.NET, ColdFusion, etc. For operation, the visual interface lets you set the tree menu's properties easily. The modification can be displayed instantly in the preview window. The multiple nodes can be added into the tree menu at the same time. Built-in templates, image library, intuitive interface, and Publish Wizard, they help to start, beautify, design and publish the tree menu. With this tree menu maker, even you are ignorant to the code; you still can build an excellent tree menu! FREE Integration with Dreamweaver, FrontPage, Expression Web and Adobe GoLive as add-ins/extensions. Animated effects are pre-created for sub menu tree. Plays sound when clicking the node including sub tree or link address, or moving the mouse over the node. Configures arrow image of the node that includes sub menu trees. Ruler function can layout the menu tree precisely. Allows setting the indent between sub-tree and parent node. Fully customizable properties, like font, icon, button, background, line, border, cursor, tool tip, etc. Selects images for arrow, icon, background button and line from our rich Image Library and Group Library. Users can edit these images freely. Free Google XML Sitemap and general sitemap generators based on your menu structure . Creating professional DHTML Drop Down menus is only a few mouse-clicks away! 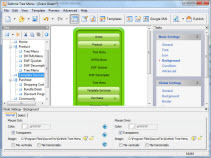 The innovative menuZap menu dialog box empowers the way you manage and select your worksheets through a menu dialog box. is designed Create tree menu for your website, Publish wizard enables you to insert tree menu code to web pages automatically. ComponentUs Menu is a powerful AJAX-enabled component for ASP.NET 2.0. OverCAD XPMenu was designed to allow you to custom your AutoCAD menu color.